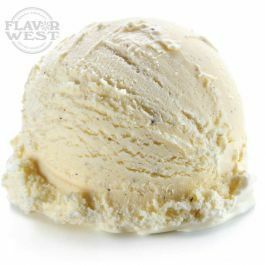 Vanilla Bean Ice Cream flavor is widely used for traditional ice creams. It offers a smooth, creamy and pure vanilla taste to your recipes. Type: Vanilla ice cream Water soluble flavoring. Ingredients: Natural and Artificial Flavoring, and Propylene Glycol. USP Kosher Grade Flavoring. Usage Rate: 15-20% for E-use. Flavor suitability: Desserts, cakes, pastries, smoothies, drinks and more. Specific Gravity: 1.04 No Refunds on Flavoring. I vape it alone or mixed with other flavors. Light and tasty vanilla bean flavor. Reminiscent of Bryer's Vanilla Bean Ice Cream.